Our divorce attorneys know very well that life after a divorce can be a labyrinth of logistical challenges. There are schedules to match and organize, visitations to coordinate, and child support payments to track. There are smartphone apps now that help you do all this with a swipe of the screen. One app called SupportPay helps parents track child support payments as well as other payments that have been made to the parent, including medical expenses and costs of extra curriculum activities. Another app called SquareHub includes a shared calendar that divorced parents can use to organize activities, and to schedule vacations. The app also includes features for text messaging and photo sharing. Apps that promote co-parenting seem to be very popular. Yet another app is 2Houses, which helps unmarried couples co-parent using shared calendars, expense tracking features, and photo sharing features. The Our Family Wizard app is one of the older apps in existence, and allows parents to co-parent more easily with expense tracking features, and tools that allow parents to share medical records and calendars. There is also a virtual diary that helps you keep on track and organize. Life after divorce can become even more hectic and you must get into the habit of creating and maintaining a schedule to keep on track of things. For advice about what you can do to help cope after a divorce, speak to a Leadville family lawyer. 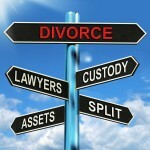 For help filing for divorce, schedule a consultation with a Leadville family lawyer. © 2019 by Parlin Law PC. All rights reserved.